The indomitable Lions of La Republique Du Cameroun(LRC) celebration of their trophy after their 2017 AFCON victory in Gabon did not go so well in the Southern Cameroons. Calling on his nation to come out in their numbers to acclaim these national heroes and salute the flag, the President of La Republique Du Cameroun Mr. Paul Biya said that the team merits congratulations as a means of encouraging other youths to be hardworking and defend the interest of their country. Unfortunately for him and shocking even to the larger Francophone populace, the trophy witness cold reactions when it arrived the Southern Cameroons cities of Buea and Bamenda. Instead of cheers they were met with a ghost town across their route as stores closed, taxi cabs stayed off the streets together with the population and even when they passed by homes that had the inhabitants indoors, the only voices they could hear were boos and catcalls not cheers. In desperation, Francophones, citizens of La Republique Du Cameroun had to be bribed and shipped in buses and motorbikes from Bafoussam and Douala in LRC to attempt to paper over a fact that had been driven home by the people of Southern Cameroons that the team is not their national team, that they are not part of LRC. 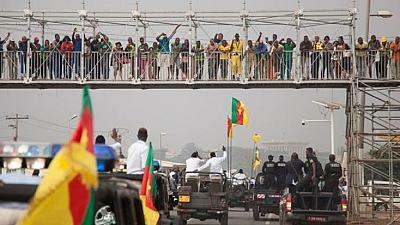 That they are free, and want no part of the unholy farce that called La Republique Du Cameroun. Cameroon’s constitution says the country is bilingual. While the government has made some reforms and promised others, it has refused to release dozens of people detained in relation to the unrest. The strike has widened with people in English-speaking areas shutting their businesses on Mondays, Tuesdays and Thursdays. Schools also remain closed. This entry was posted in News and Events, Sports. Bookmark the permalink.